Although we cannot replace home, our aim is for every pet to be happy while staying with us. As a family-run business, our passion is to provide your pet with a great holiday while you are away and ensure that you can also relax by providing you with the peace of mind that your pet is in great hands. Our team works particularly hard to ensure that your pet’s needs are met. 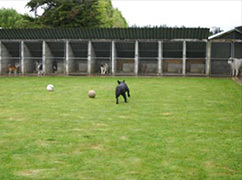 This allows us to offer all animals a safe and secure home away from home whilst they’re with us. Please feel free to have a look at our services in more detail and if you have any questions or would like to arrange a booking or inspection please contact us. If you wish to purhase an Igloo kennel, please click on the Igloo Kennels For Sale link.